Can't We Just Ban Grad Students? 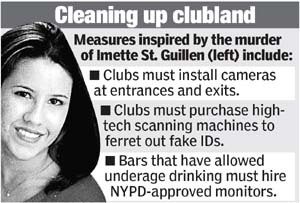 I look forward to the installation of NYPD-approved minders at, say, the rockstar bar on Siegel in Bushwick. Or Welcome to the Johnsons. Or, hell, any bar within a half-mile of Washington Square Park. Imette was 24, right? Did her license have a "should be kept away from sexual predators when drunk" restriction that an optical scanner woulda picked up? "Today we begin the process of insuring that the safest big city in the world also has the safest nightlife," said Councilman Peter Vallone Jr. (D-Queens), formerly the single least popular guy at Fordham.